Experience snorkeling at Maui's premier snorkeling destination, the sunken islet of Molokini Crater. Maui Classic Charters takes you to this atoll on a morning sail and snorkel adventure to Molokini. Throughout the trip, an expert marine naturalist will share stories and answer your questions about the area, its history, and the marine inhabitants of Hawaii's waters. Guests can also view sea life while staying completely dry from within the exclusive glass-lined room located in the port hull of the vessel. See a number of incredible creatures from the safety and comfort of this unique room on the Four Winds II, or jump in for an amazing snorkeling experience! Accessibility: This vessel is wheelchair accessible. Continental Breakfast: Fresh Bagels with cream cheese, Jellies, Tropical Fruit, Coffee, Tea & Juice. Deluxe Hot BBQ Lunch: Choice of Savory Pulled Pork Sandwiches, Marinated Chicken Breasts, Hot Dogs, and Vegi-Burgers. *Dietary Restrictions: If you have special dietary requirements you are most-welcome to bring your own food on board the boat. Please note that the veggie patties are cooked on the same grill as the meat items that we BBQ for lunch. Gluten-Free all-beef hamburger patties (with no filler), marinated chicken breasts, and all the above mentioned trimmings. Inclusion: Instruction / Soft drinks / Juice / Alcoholic beverages / Lunch / Snorkeling equipment (snorkel, mask & fins) / Sea Boards (large flotations with a clear bottom viewing window), Boogie Boards, Floatation Belts, and Life Vests. About two hours is spent at Molokini, giving you more time to snorkel and explore the marine environment at your own pace! The cruise provides breakfast, lunch, drinks, and all the snorkeling equipment you'll need! From Lahaina / Kaanapali (20mi, 30-40min): Head south on HI-30 (Honoapiilani Hwy). As you reach Maalaea, turn right into Maalaea Village onto Maalaea Road. The Harbor will be on your right. From Makena / Wailea / Kihei (10-15mi, 30-40min): Head north on State Highway 31 (Piilani Hwy). Follow signs to Lahaina and take a left to stay on the Piilani Hwy and continue onto N Kihei Road. Take a left onto HI-30 (Honopiilani Hwy) and then take a right onto Kapoli Street at the 76 Gas Station. Turn right onto Maalaea Road. The Harbor will be on your left. Parking Information: Parking at the harbor is limited and fills up early, please get there early to secure one of the free parking spots, otherwise parking is available for a small fee in the surrounding lots. Snuba participants must be 8 years old & older. Wheelchair Accessibility: Ramp meets level to the boat for boarding. On-board bathroom is not ADA compatible but assistance is available from the crew. Please indicate during booking for most convenient arrangements. A valid, government-issued photo ID is required to consume alcoholic beverages. Whale and dolphin sightings are not guaranteed. 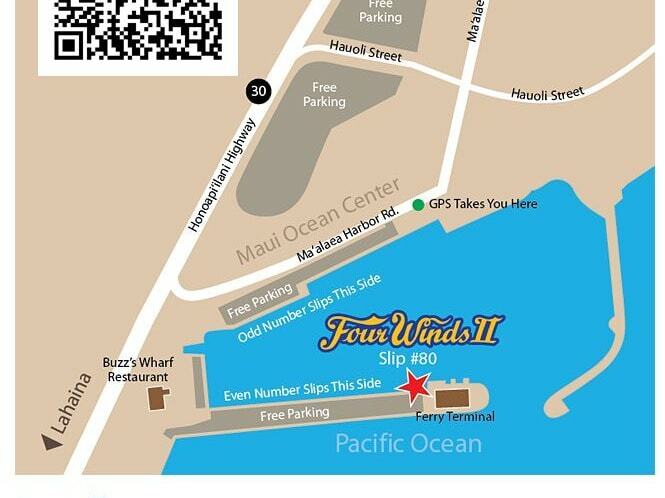 For cruise ship passengers, driving distance to Maalaea Harbor from the Pier (Lahaina or Kahului) is approximately 45 minutes away by taxi. Snorkel sites are selected at the discretion of the captain. An alternate site will be chosen if undesirable ocean conditions exist at Molokini. No, you are not required to be able swim. You are welcome to stay on the boat or grab a flotation device to hold on to. They also have "See Boards" which are like large boogie boards equipped with a Plexiglas viewing port. Yes, there are prescription masks on board ranging from -2 to -7. What happens if the ocean conditions are rough? Molokini's crescent shape protects it from the majority of strong waves and currents. However, if the captain decides that the weather at Molokini will be unfavorable, Coral Gardens will be chosen as a snorkeling destination instead. Very attentive staff, great experience. Food was good, saw lots of fish and an eel.